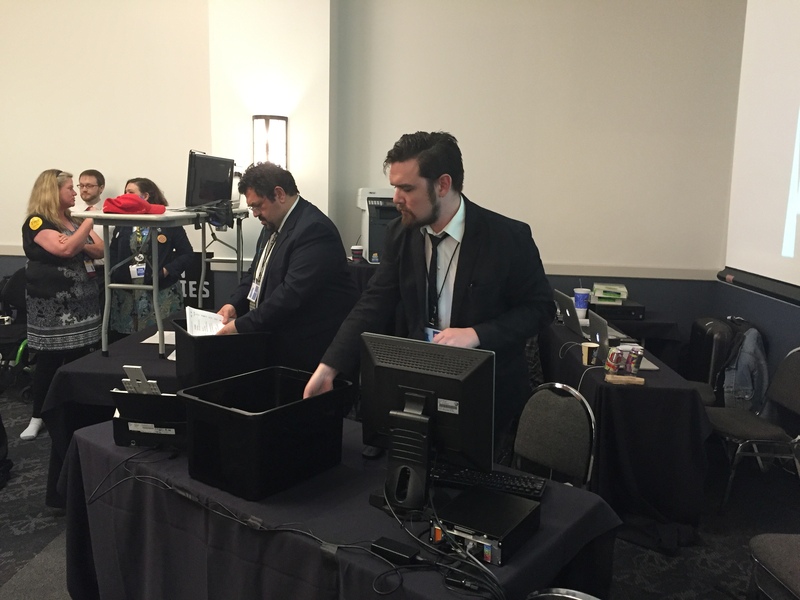 San Antonio, TX – Blockchain Technologies Corporation (BTC), the New York-based innovator in blockchain voting solutions, was busy this weekend (April 9-11) live printing custom paper ballots on the convention floor and indexing their elections’ results on multiple blockchains while at the 2016 Libertarian Party of Texas (LPTexas) State Convention. For the LPTexas elections, BTC used paper ballots to not only preserve the age-old familiar paper voting process, but also to have physical evidence of every election’s results. Once voters turn in their marked ballot, it is run through a scanner that uses optical mark recognition (OMR) technology to extract the vote data from the ballot. Once scanned, the ballot data is sent to multiple blockchain databases — in this case Bitcoin and Florincoin — for secure, permanent, and transparent record keeping. These distributed consensus systems are made for displaying immutable time-stamped and signed records with one key feature — once a record is added to a blockchain, it cannot be removed or manipulated. For example, transactions posted to the Bitcoin blockchain that do not conform to the blockchain in use on millions of computers worldwide will be rejected. Think the county clerk’s office, state voting authority, or private entity—but governed by math, transparent by default, and absent human error. Because candidates to be voted on were nominated from the convention floor, the ballots needed to be designed and printed on the fly at the convention itself. One of the ballots had 83 candidates on it and required two rounds of approval voting to elect 71 delegates to the National Convention. Although their professional-grade high speed printer almost started a fire while printing hundreds of ballots, crisis was averted and tabulating the results of the election went smoothly. The votes BTC processed at the LPTexas State Convention are already indexed and available for public viewing on www.VoteTexas.com. For more information on BTC including its voting technology, please visit www.blockchaintechcorp.com and follow them on Twitter @blocktechcorp.